Here we are at the end of August, about to enjoy our last long weekend of summer. We thought it might be a nice kick off to the weekend to share our latest rescue story with you. 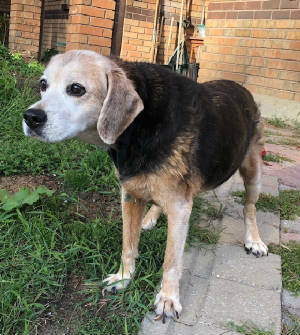 Yesterday, we saved this 16 year old beagle. Her name is Molly. We shouldn't be extending ourselves right now. We need to take time to build up our funding again. But we couldn't say no to Molly. 13 years ago, she was adopted from a shelter. Now, her elderly owner is moving to a seniors residence and he can't take her with him. It is a heartbreaking scenario and it's all too common. But we had to meet Molly first. We had to be sure that she could overcome the loss of the home she's had for all these years and the only owner she's ever known. Sadly, she hasn't had the best care in the last while. Her owner's wife passed away some time ago and he hasn't been able to manage her as well on his own. Molly's nails have overgrown and she hasn't seen a vet since the winter. Her days are spent in a small apartment and she's rarely walked. Nevertheless, that's all she's known for a very long time. It's home to Molly. But Molly has a lot of life in her yet! We brought Sam the Pointer along with us yesterday and she couldn't stop planting kisses on his face! She also took to galloping about the patch of grass outside her owner's ground floor apartment like a spry young horse! Despite some stiffness in her limbs, bad hearing, and cloudy eyes, Molly's got GAME! She has the potential to unleash her inner puppy with a little help from us! All it takes is some good care and a whole lot of love. So we put aside our financial worries and we gathered her up right then and there. She's already been to see our vet and the blood results look fairly good! But her teeth are terrible and a mass on her cheek needs to be tested but we want to give Molly some time to adjust to a new life and a new world before subjecting her to a dental.